CLEVELAND — Joey Gallo and Isiah Kiner-Falefa homered on consecutive pitches off Nick Goody in the 12th inning and the Texas Rangers beat the Cleveland Indians 8-6 on Tuesday night. Michael Brantley tied the game in the ninth with a two-out grand slam off Keone Kela, but the Rangers bailed out their closer who entered the game with a 6-2 lead. Goody (0-2) recorded the final out in the 10th and stranded two runners in the 11th. The right-hander retired Nomar Mazara to start the 12th, but Gallo homered to dead center to put Texas ahead. Kiner-Falefa, who had a career-high four hits, homered into the bleachers. Alex Claudio (1-1) pitched the final three innings. Kela entered the game to begin the ninth in a non-save situation and loaded the bases with one out. Tyler Naquin singled and Bradley Zimmer hit into a fielder’s choice. Singles by Francisco Lindor and Jason Kipnis loaded the bases. Jose Ramirez struck out on a full count before Brantley hammered an 0-2 pitch to right for his first career grand slam. Edwin Encarnacion singled and was replaced by pinch-runner Rajai Davis, but Yonder Alonso struck out. Kela, who converted his first six save chances, allowed four runs and five hits in one inning. Brantley had a chance to win the game in the 11th, but grounded out to end the inning with Ramirez on second. 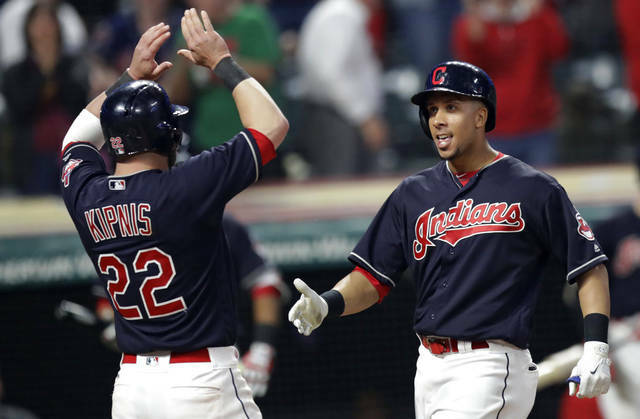 The Rangers bounced back from Monday’s 7-5 loss, when the Indians scored five times in their final two at-bats. Jurickson Profar drove in a career-high three runs, and Delino DeShields and Mazara homered for Texas. Texas reliever Jake Diekman was struck in the back by Encarnacion’s line drive in the eighth. The pitcher was on the ground briefly, but remained in the game after throwing a few warmup pitches. The ball ricocheted to first baseman Ronald Guzman, who completed the out. Diekman was removed after walking Alonso. Doug Fister took a shutout into the seventh and was pulled after Kipnis’ two-run double. The veteran right-hander gave up Yan Gomes’ leadoff single and committed a throwing error after fielding Naquin’s ground ball. Fister retired the next two hitters and his error made both runs he allowed in 6 2/3 innings unearned. Profar had an RBI double in the fifth and a two-run double in the seventh. DeShields hit a solo home run in the fifth — his first of the season — and Mazara’s two-run homer capped a four-run rally in the seventh. Mike Clevinger allowed three runs in 6 2/3 innings. Rangers: RHP Chris Martin (forearm cramp) was unavailable after allowing four runs in the eighth inning Monday. Manager Jeff Banister said it’s too early to know if Martin will need a trip to the disabled list. Indians: LHP Ryan Merritt (sprained left knee) will begin a rehab assignment at Triple-A Columbus this week. He’s been throwing in extended spring training after being injured during the exhibition season. Rangers LHP Matt Moore (1-3, 5.33 ERA) faces RHP Corey Kluber (4-1, 2.18 ERA) in the series finale. Moore’s last start in Cleveland occurred on May 31, 2013, and ended after one inning in a game that featured 4 hours, 49 minutes of rain delays and ended at 2:53 a.m. Kluber, who also started, pitched two innings and was pulled after a delay. The reigning AL Cy Young winner has won his last four starts.